What is the Sylenth1 teaser image teasing? A new version, a tweaked UI, a Rack Extension... or something else? It's consistently voted one of the best plugin synths in the world today, but major revisions to Sylenth1 are infrequent to say the least. It's caused some excitement, then, to see developer LennarDigital post a teaser image on the Sylenth1 Facebook page. What this is teasing isn't exactly clear: some users are claiming it's just a new UI; others are desperately hoping for a Rack Extension version; while Mac users are demanding 64-bit compatibility. 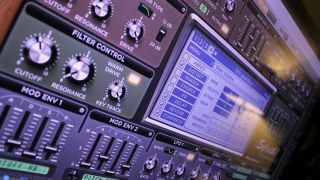 UPDATE: Sylenth1's developer has posted the following comment on the Computer Music magazine Facebook page: "The update is a completely rewritten Sylenth1 in 32 and 64-bit for Windows and Mac hosts in VST/AU and AAX (ProTools). The GUI will be resizeable and skinnable. Next to this we've tightened up the sound processing a bit and made some minor changes in its usability."